Taunt. Deathrattle: Summon a 1/2 Slime with Taunt. Sludge Belcher is a rare neutral minion card, from the Naxxramas set. Its Deathrattle summons Slime. Two copies of regular Sludge Belcher are obtained by defeating Loatheb in Curse of Naxxramas's Plague Quarter. Sludge Belcher is a substantial taunt with some serious staying power. His 5 Health allows him to soak up multiple weaker attacks, while his 3 Attack allows him to serve as a useful attacker for dealing damage to the enemy hero or for mopping up valuable minions. However, his most notable quality is his Deathrattle, summoning a 1/2 Slime with Taunt. This generally ensures that at least two attacks are required before other targets can be attacked, making this a very useful taunt for protecting valuable targets or a low-Health hero. Sludge Belcher is essentially a combination of Sen'jin Shieldmasta and Goldshire Footman, for the same total mana cost. Sludge Belcher is a very effective counter to minion-heavy aggro decks, focusing on dealing rapid damage to the enemy hero using a swarm of weaker minions. The Belcher can not only trade for at least two of these smaller minions, but will also leave a weaker taunt behind which, due to many charge or 'swarming' minions having only 1 Health, will often manage to trade for yet another minion. The main limitation of the Belcher as an anti-aggro card lies in its mana cost, making it too late in the game to counter early damage. Using other taunts and clears like Unstable Ghoul can allow the player to survive long enough to bring out the Belcher, seriously impeding the aggressive early game that minion-heavy aggro decks depend on. In any type of play, the Belcher's main weakness is to neutralisation through Silences and Transformations. Sludge Belcher is an elite Abomination found in the Construct Quarter of Naxxramas. He summons non-elite Bile Sludge mobs. The artwork for this card comes from the World of Warcraft Trading Card Game "Reign of Fire" series, for the card Vilegut. 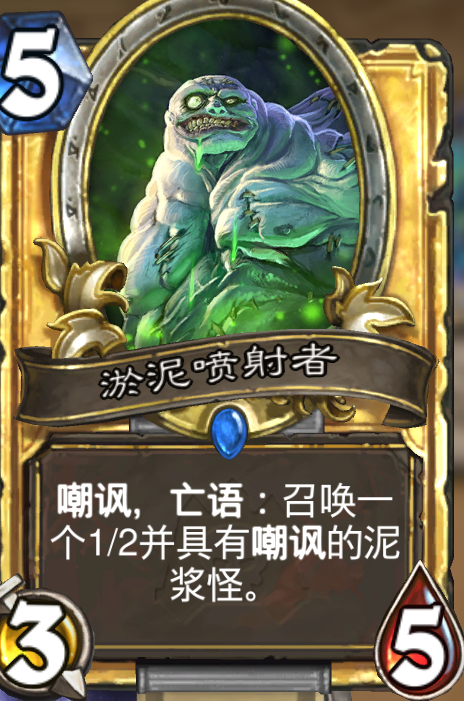 This card has different artwork in China, due to the regulations about depicting bones and death. ↑ Ben Brode on Twitter. (2015-09-08). This page was last edited on 17 June 2018, at 04:24.